Priced as marked. Shipping costs not included. Shipping will be determined on a case-by-case. Local pick-up and delivery available. This posting will be updated periodically. Payment via Paypal: payment to kutzscher12@gmail.com - you must choose "send payment to friends or family", otherwise your order will not be accepted. Payment via cash will be required at time of pick-up/delivery of items for local customers. All samples come boxed in cute S&D packaging! 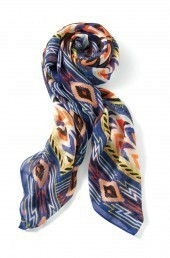 Add a twist to a classic outfit or wrap up your look with our luxurious silk blend printed scarf. With a myriad of ways to wear it—twisted, double-up, wrapped, tied—it may very well be your most versatile wardrobe piece. 38" x 70"
Easy snap carrier on the outside to make sure you never miss a call, large enough to fit smart phones in multiple sizes. 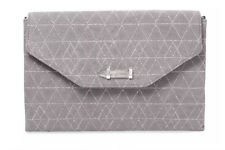 Zip-around wallet with a removable wristlet. Textured vegan leather in back/cream stripe. 3 3/4" high, 7 1/4" long, 1.5" wide. Delicate, reversible, and giftable! 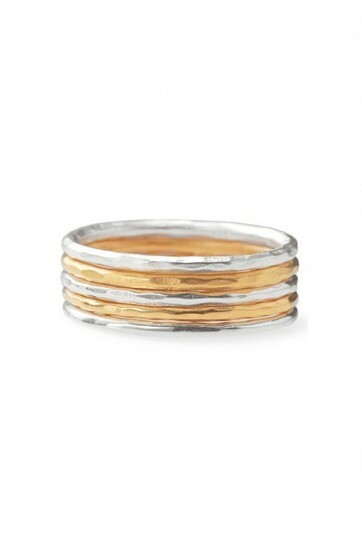 Wear with subtle pavé sparkle or reverse for sleek shiny gold or silver. 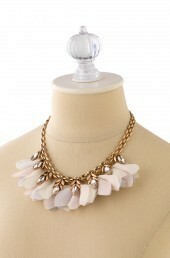 Looks great layered with other delicate necklaces. 15 3/4" chain with 3" extender, and lobster clasp closure. 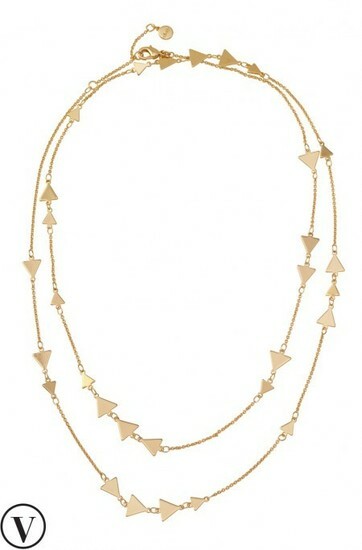 Hand cast, shiny gold triangles are stationed along a simple chain necklace. Can easily be worn long, doubled up, or layered with other delicates. 36 1/4" chain with 2" extender and lobster clasp closure. 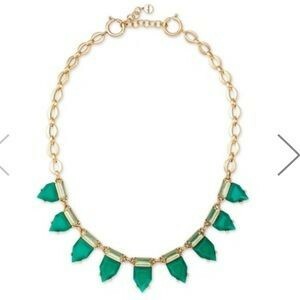 Gives any outfit an easy pop of color. 17" chain with 2" extender, and spring clasp closure. 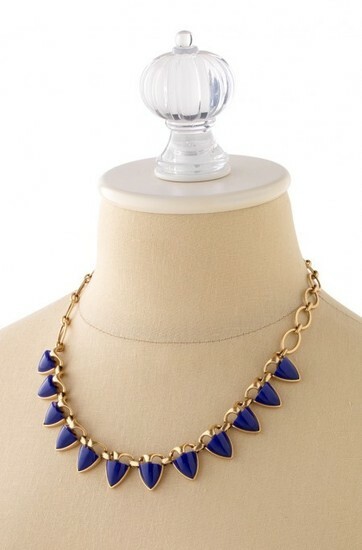 An easy, eye-catching pop of cobalt. 19" chain with 2" extender, and spring clasp closure. Hand-set micro pave set in a slender crescent make a delicate statement to pair with any look. 24" with 4" extender, with lobster clasp closure. 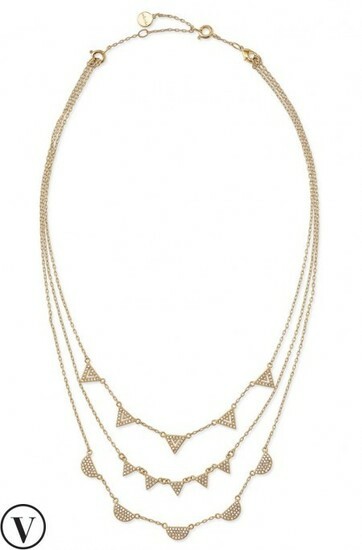 Three strands of delicate hand-set micro pavé geometric shapes take the guesswork out of layering. 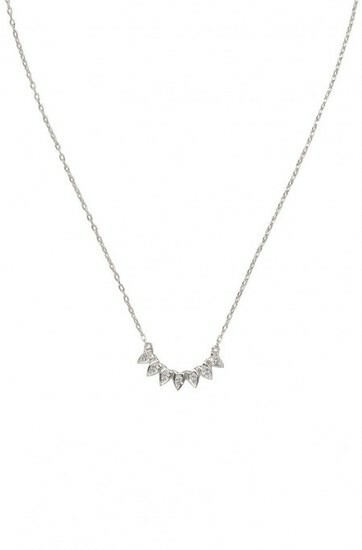 Wear with all strands clipped together as one necklace, or unclasp any of the strands to create you favorite combination. 17" chain with 2" extender and lobster clasp closure. Chic leather and sweet chiffon petals blossom below a versatile botanical inspired silhouette. 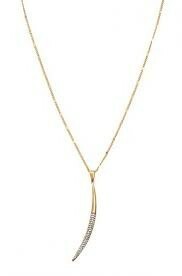 Wear as a statement necklace, detach petals for a stand alone sparkle strand, or reverse for a solid gold strand. 17 1/2" chain with 3" extender, and lobster clasp closure. 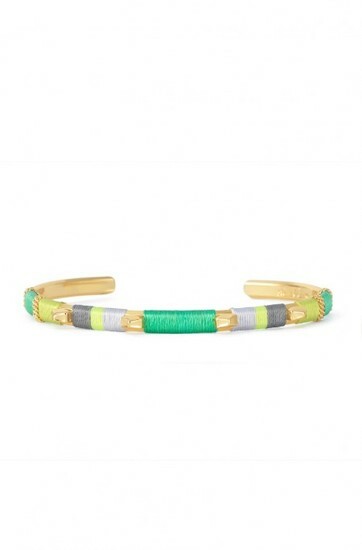 Coloblocking will never go out of style, and it gives this delicate cuff bracelet the right amount of boldness. 2 1/4" inner diameter, fits sm-lg wrists. old coil bracelet with accents of soft blue and smokey sparkle and silver coil bracelet with accents of neutral sparkle. To put on, simply wrap around wrist. 2 1/4" inner diameter, fits sm-lg wrists. 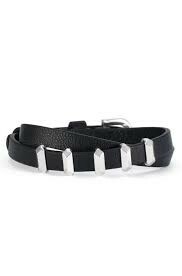 This genuine black leather bracelet is accented with fixed silver bars. Looks super chic alone or paired with your favorite cuffs and bangles. 12 1/2" adjustable to 14 1/2" with buckle closure. Fits sm-lg wrists. 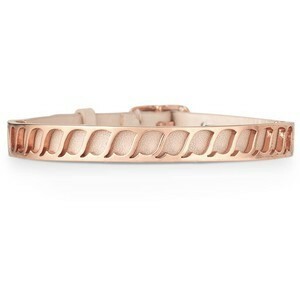 Malleable rose gold cuff atop a champagne leather band. Fits sm-lg wrists with buckle closure. 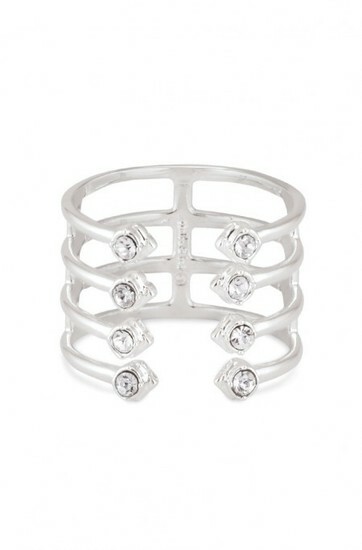 Beautifully sleek finish, our Cage Cuff is simple yet chic. Fits sm-lg wrists. Love is all around. 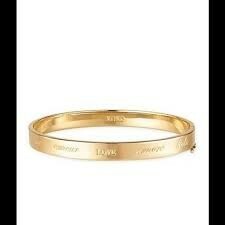 Wear this timeless bangle to celebrate the greatest virtue. Inscribed in English, French, German, Italian & Spanish. 1/4" wide, fits sm-lg wrists with a pressure hook closure. 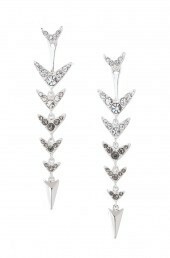 Hand set micro pavé chevrons form this delicate gradient arrow drop earring. Reverse from sparkle to shiny silver or remove drop for a simple stud. 1 7/8" drop length, feather weight. Eight clear crystals come together to form this stunning split ring. Size M/L fits ring sizes 7-9, adjustable for added comfort. Classic set of five hammered silver and gold plated brass bands. Size 9.